Growing up, we ate so many noodles that I was convinced they were their own food group. And to this day, there are few things that make me happier than a heaping pile of noodles. Pasta, ramen, udon, vermicelli...I don’t discriminate, I’ll take them all. Thankfully, Anguel feels the same way. Warmer months are however a tad more challenging when it comes to squeezing in our regular dose of noodles. Things got a bit desperate a couple weeks ago, as we rallied through the 30°C/86°F heat and sweated our way through steaming bowls of veggie Pho. It was delicious, but as we mopped our foreheads and made an outfit change back at home, we knew there had to be another way. On a mission to find the perfect summer-appropriate noodle fix, we’ve now eaten our way through many bowls of noodles. We tried a few variations, but this Soba Noodle Salad turned out to be our favorite. It’s easy to prepare, has very limited cook time (think 5 minutes on the stove), and is jam-packed with colorful veggies. It also keeps well during the week, which is a total win for our lunch game. Buckwheat noodles (soba) form the base of this dish. These noodles are popular in Japan, and served either hot or cold. You can always multiple varieties at Asian grocery stores; but luckily, buckwheat noodles are mainstream enough that most standard grocers carry them too. If you can, pick noodles that have a short ingredient list. All you really need is buckwheat flour and water. However, most brands add in other types of flour (like yam flour or wheat flour) to cut the buckwheat. It tends to be cheaper and the taste is a bit milder. Choose whichever you prefer, but know that buckwheat flour is gluten-free when many of the other fillers are not. Eden Foods is the only brand that our grocery store stocks with a 100% Buckwheat noodle. 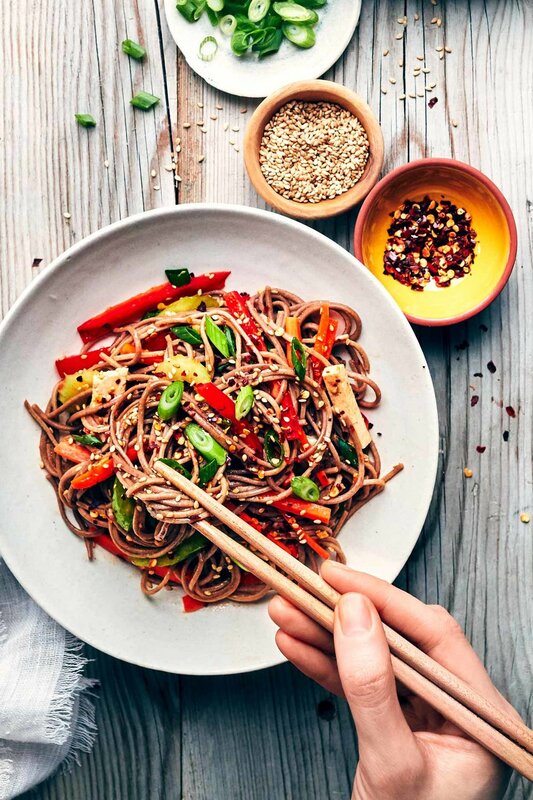 Buckwheat noodles are high in fiber so we find they’re more satiating than a comparable amount of pasta noodles. Healthy choices, for the win. Besides cooking the noodles, the rest of the dish simply requires you to whisk together a marinade and slice up some fresh veggies. The fragrant sesame marinade doubles as a flavor booster to the tofu, before getting poured on top of the noodles to coat them in delicious sauce. You might notice this recipe doesn’t call for cooking the tofu. While we usually pan-fry or bake our tofu, it isn’t really necessary in this dish (especially in this weather). Tofu doesn’t need to be cooked before getting eaten, it’s more just a flavor and texture thing. So we encourage you to cut yourself some slack in the kitchen and just dump the tofu directly in the marinade. It’ll mean minimal time over the hot stove. But if you prefer to cook it first, by all means do your thing. The Soba Noodle Salad can be served warm or cold, which gives you a lot of flexibility with prep. We usually eat this dish warm in the evening (just after we make it), but then eat it cold straight out of the fridge for lunch the next day. 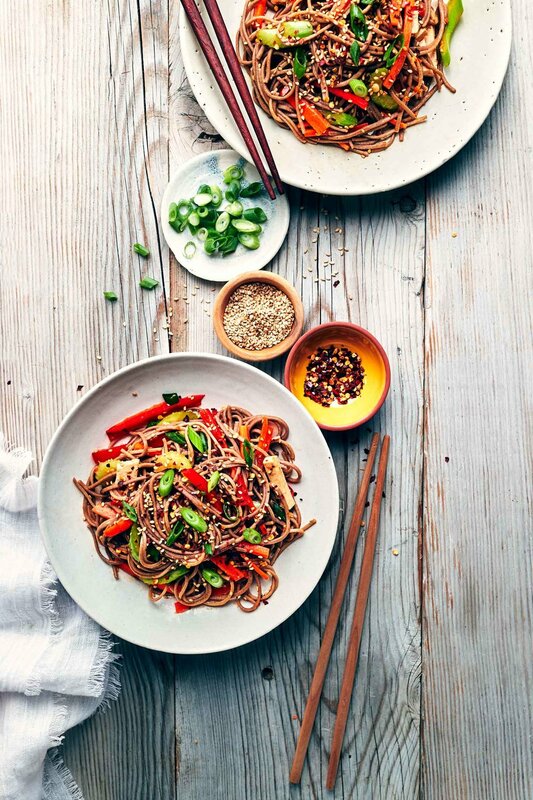 Either way, this Soba Noodle Salad is super easy to make and tastes great. We hope you enjoy! Start by making the sesame marinade. Whisk together tamari, lime juice, rice vinegar, toasted sesame oil, neutral oil, Sriracha, maple syrup, garlic powder and fresh ginger. Use a clean dish-towel to pat tofu dry. Slice tofu into thin strips, about 1 1/2" long, 1/2" wide, 1/4" thick (or 4 cm long, 1 cm wide, 0.5 cm thick ). Place tofu into a dish, pour in prepared marinade and organize tofu pieces so they’re fully submerged. Set aside. Boil water and cook buckwheat noodles according to the manufacturer's directions (usually 5 minutes; do not overcook). Strain noodles and rinse thoroughly with cold water to stop the cooking process. Shake off excess water, then transfer cooked noodles to a bowl. Pour as the marinade into the noodles, holding back the tofu for now. Toss noodles thoroughly in marinade. Add carrots, celery, red pepper, toasted sesame seeds and red chili flakes then toss to mix. Add tofu pieces then stir gently to combine. Garnish with extra green onions, toasted sesame seeds and/or red chili flakes if desired. -*For gluten-free soba noodles, be sure to read the labels. Many brands mix wheat flour with buckwheat flour. Gluten-free options are usually made from 100% buckwheat flour.